The Galloping Ghost of the Java Coast, was a Northampton-class heavy cruiser of the US Navy, and was the second ship to bear the name “Houston.” On January 10, 1931, the cruiser departed for the Pacific after a stop at the Panama Canal and the Hawaiian Islands. The Houston arrived in Manilla on February 22, 1931. Following the outbreak of war between China and Japan, the Houston sailed to Shanghai to protect American interests. There she landed Marine and Navy gun platoons to stabilize the situation. The Houston sailed to several other locations in the Pacific before returning to the US in November of 1933. While in the US, the Houston made several special cruises. Later, she became a flagship of the US Fleet in September of 1938 when she returned to the Scouting Force. Later assigned as part of the Hawaiian Detachment, the cruiser arrived at Pearl Harbor on December 7, 1939, and continued in that capacity until February of 1940. She departed for the Philippine Islands on November 3rd and arrived on November 19, 1940 and was assigned to Admiral Thomas C. Hart, Commander of the Asiatic Fleet. There she served as his flagship. 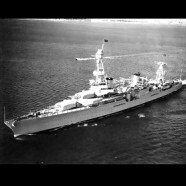 Before the war broke, the Houston received four anti-aircraft cannons that were fitted for added air defense protection. On the night of the Pearl Harbor attack, the Houston got underway from Panay Island in the Philippines bound for Darwin, Australia. During the Battle of Makassar Strait, the Houston’s gunners shot down four planes in the Battle of Bali Sea in February of 1942. The Houston took one hit and was forced out of the battle area. Arriving for repairs, she left for Darwin, Australia escorting several ships. On the morning of February 15, 1943, she was shadowed by a Japanese flying boat that dropped bombs without causing damage. Later, during a second attack, the Houston distinguished herself with a barrage that made her look, “like a sheet of flame”(Gill quoting Morrison’s History of United States Naval Operations in World War II: The Rising Sun in the Pacific, 1931-April 1942, p. 315) shooting down 7 of the 44 planes of the second wave. On February 28, 1942, the day sfter the Battle of the Java Sea, the HMS Perth and Houston, it is believed had no knowledge of the Japanese battle fleet they were about to encounter. The Perth and Houston were both attacked. During this battle the Perth came under fire and was sunk from gunfire and torpedo hits. On the Houston, shells were in short supply, and the Houston fought alone until after midnight, when she was struck by a torpedo and began to lose headway. She then suffered three more torpedo explosions in quick succession. As the ship came to a stop Japanese destroyer moved in, machine gunning the decks. A few minutes later, the Houston rolled over and sank, her ensign still flying. Of the original crew of 1068 men, 368 survived and the hours-long swim to the shore of Java. They were captured by the Japanese and interned in prison camps there. Once captured, the men began a life of primitive hardships and brutal treatment that would last for three and a half years. Following the weeks of fighting and the ordeal in the water, the men were exhausted and hungry, many of them covered in oil from the ship. Some were very badly burned. Groups of captives were marched and forced to endure “bashings” from the Japanese, who used their rifle butts to keep the men moving. The Japanese took their American prisoners to the town of Serang, where they spent a week crowded into the local theater along with Australian and Dutch prisoners, with little food and no medical treatment, before being moved to the local jail, where conditions were equally bad. In April 1942, most of the men were transported to “Bicycle Camp” in Batavia. Bicycle Camp, which had been the quarters for the Tenth Battalion Bicycle Force of the Netherlands East Indies Army, offered the POWs the best conditions they would experience as prisoners-of-war. The men had access to showers and running water, and were housed three to a room in barracks with cement floors. In Bicycle Camp, the men of the Houston were joined by troops from the 2nd Battalion, 131st Field Artillery, a National Guard unit from Texas (dubbed “the Lost Battalion” because their whereabouts were unknown during World War II). In October, the majority of the POWs were taken from Bicycle Camp to Singapore, while the rest were sent to work in various camps throughout Asia. This journey to Singapore was one of the most horrific experiences of their captivity, as men were jammed into the holds of rusty old freighters such as the Dai Nichi Maru. The POWs spent several days and nights on these “hell ships” with no room to move and barely any rice to eat, amid men who were now sick with dysentery. Upon arriving, the men spent several weeks at Changi Camp before taking another hell ship to their ultimate destination in Moulmein, Burma. When the 131st came dragging in (to the Bicycle Camp), other prisoners were already in the barracks – Australian, British, and Dutch. And yet other, in a building to the right of the main gate, with barbed wire strung across the porch, men were peering out, starved bodies, terrible-looking scarecrows in shorts made of sacking, green straw hats, sarongs, bits of native blanket, anything and nothing, bodies starved and unwashed, worse than unwashed, coated in fuel oil. They turned out to be American. They were all that was left of the crew of the USS Houston, caught and sunk in the Sunda Strait during the Japanese Invasion of Java. . . some 350 washed up on Java. They herded them into a movie theater with other POWs – about 1,500 white bodies in a movie house that would have been full with 500 Javanese. The guards made everyone sit at attention for hours while they tried over and over to count them and failed. An officer with his hand on his sword, served his emperor by kicking the wounded. They received no medical attention. At night they would lay on top of each other in the stink of festering wounds. The latrine was an open pit outside, with flies rising off it in huge clouds, making a blaring noise like a brass band. They were fed one ounce of rice each day, plus a tiny loaf of bread, two by two by four inches. One of the marine privates, only a boy, said, This is not how my mother made bread. He was the first of the Houston to die.